With the holiday season nearing it's end we are needing rolls a little less, but this recipe is a great one that is extremely simple and should definitely be in all of your dinner party repertoires. It is from a 1950's Better Homes & Gardens recipe book I inherited from my grandmother. Most people think it's a lot easier to head over to Costco and buy a bag of rolls, and as easy as that may be, for some odd reason I find sitting in my kitchen (rather than getting in a car during the most crowded times of the year to brave the masses) and mixing the ingredients for these rolls, to be much easier. - Soften yeast in warm water (about 110º). - In a saucepan heat milk. Add butter, sugar and salt. Cool to lukewarm. - In a your mixer bowl add 1 1/2 cups of flour to milk mixture; beat well (use hook attachement). - Beat in yeast and egg. - Gradually add remaining flour to form soft dough, beating well. - Place in greased bowl, turning once to grease surface. - Cover and let rise until double (1 1/2 to 2 hours). - Turn out onto lightly floured surface. - Let dough rest for about 10 minutes, this will add elasticity and make rolling it out much easier. - Roll dough to a 27x14-inch rectangle, 1/4 inch thick (use a measuring tape, it will help to be accurate). - Cut crosswise into 18 1 1/2 inch strips. - Brush with melted butter. - Stack 6 strips; cut in 9 portions. - Place most recently cut side down in greased muffin pan. 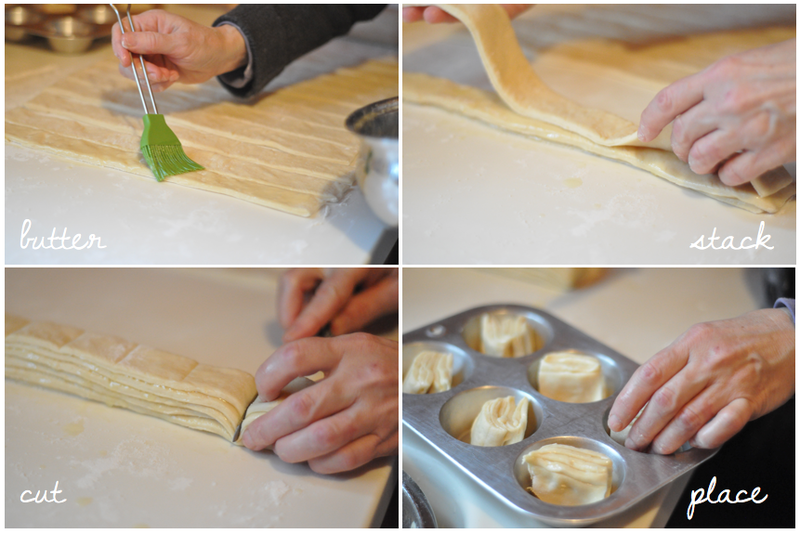 - Let shaped rolls rise until doubled in size (30-45 minutes). - Bake on 400º for 12-15 minutes (watch carefully, each oven is different). This recipe makes two dozen rolls. I doubled it to have enough for my large party.